Silchar, Apr 30 : Normalcy returned to Barak Valley districts and bordering Mizoram today, after the tension of the past few days. Tension has been simmering in Mizoram since last week in the wake of a campaign by a few Mizo student and youth groups, directing non-Mizo shopkeepers in Aizawl to wind up their business. Matters took a turn for the worst when the traders were forced to close shopon Tuesday and a majority of them started fleeing the state to their homes in Barak Valley. Yesterday, the Mizoram home department rounded up seven members of a youth group, Mizo Tlangval Pawl, including its president Vanlalmawana, for allegedly fomenting inter-community tension. 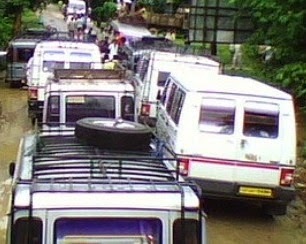 In Cachar and Karimganj districts of Barak Valley in Assam, a few local organisations put up an indefinite blockade on Monday morning in protest against the threats to non-Mizo traders in Aizawl. But they withdrew it in the afternoon after the district administrations intervened. Last evening, Cachar deputy commissioner G.M. Hazarika held a meeting with the agitating organisations and assured them that he would take up the matter with senior officials in Dispur. It was attended by local residential officers of Mizoram V.M. Thanga and Biswanath Bhattacharjee, senior officials of Cachar administration and representatives of the agitating organisations. Sankar Dey, secretary of the Forum for Protection of Non-Mizos, one of the agitating organisations, said they would freeze their agitation for a week. But in case of any reprisal on any non-Mizo shopkeeper in Mizoram, the agitation would again gather momentum.